SoundingBoard supports iOS devices running version 3.1 or later, including iPad. This screen shot is from the iPhone version. AbleNet has launched SoundingBoard, an app for iOS devices that allows teachers to build communication boards for students with verbal communication disabilities. SoundingBoard is designed to be a straightforward tool for creating a means of communicating using symbols that correspond to recorded messages that are played back by the device. 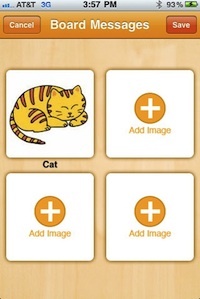 With support for iPad, iPhone, and iPod touch, SoundingBoard provides a library of hundreds of pre-defined AbleNet symbols and allows users to create their own using photographs or other images. Symbols can be imported from an existing image library or created on the fly with the device's camera. SoundingBoard runs $49.99 and requires an iPad, iPhone, or iPod touch running iOS 3.1 or later. It's available now in the Apple App Store here. Further information can be found on AbleNet's site here.